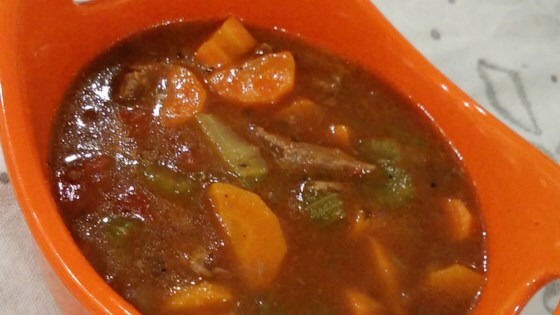 "This is not your typical Instant Pot® stew. It has no potatoes, but it does have tons of flavor. Serve with lots of crusty bread and enjoy!" Heat oil in the pot of an electric pressure cooker set on Saute mode. Add beef; cook until browned on all sides, about 5 minutes. Add onion and cook, stirring constantly, until soft, 3 to 5 minutes. Add garlic; cook until fragrant, about 1 minute. Pour wine into the pot and bring to a boil while scraping the browned bits of food off the bottom with a wooden spoon to deglaze. Add carrots, celery, and tomatoes; stir well. Add 1 1/2 cups chicken broth, thyme, bay leaf, salt, and pepper. Close and lock the lid. Select Meat/Stew option or high pressure according to manufacturer's instructions; set timer for 35 minutes. Allow 10 to 15 minutes for pressure to build. Mix 1/3 cup broth with cornstarch to make the slurry. Release pressure carefully using the quick-release method according to manufacturer's instructions, about 5 minutes. Unlock and remove the lid. Select Saute option and bring mixture to a boil. Slowly add in the slurry. Let simmer until stew thickens slightly, 3 to 5 minutes. Use any extra-lean cut of beef you like. Delicious! I added potatoes and served it with homemade buttermilk rolls. I added potatoes and used beef broth instead of chicken broth.